A little over five years ago, during my freshman year of college (2009/2010), I first realized my desire to be a designer. I’d always had a love of art/painting and spent time in grade school and middle school playing around in Photoshop and in high school designing ads and spreads for the yearbook, but it never really clicked until I was in college. Before I went to Tulane, I toured SCAD’s campus and dreamed about how amazing it would be to study there, but I thought being an artist meant having to sell paintings on the sidewalk. So I went to Tulane and planned to major in English and become a teacher, just like my grandparents. I won’t go into my entire creative story thus far, but after mentioning a bit about Anna Maria Horner and her role in my design career, I wanted to share a little more about it. During my freshman year at Tulane, one of my classes took a field trip to visit to a small art gallery/publishing house where I met the first person I’d known who called themselves a “graphic designer.” Something clicked in me during that visit, and I started to realize that design was the career I’d been looking for all along — a way to be artistic and creative, but in a practical way. I moved back home for the summer (between my freshman and sophomore year) and interned at a graphic design/printing company in my hometown. There I learned the very basics of Adobe InDesign, a bit about vectorizing in Abobe Illustrator, how to create logos/business graphics, set up print jobs, and about vinyl cutting and screen printing techniques. While living back at home, I spent a good chunk of my summer re-designing my childhood bedroom, gardening, painting, and reading my mom’s Country Living magazines. 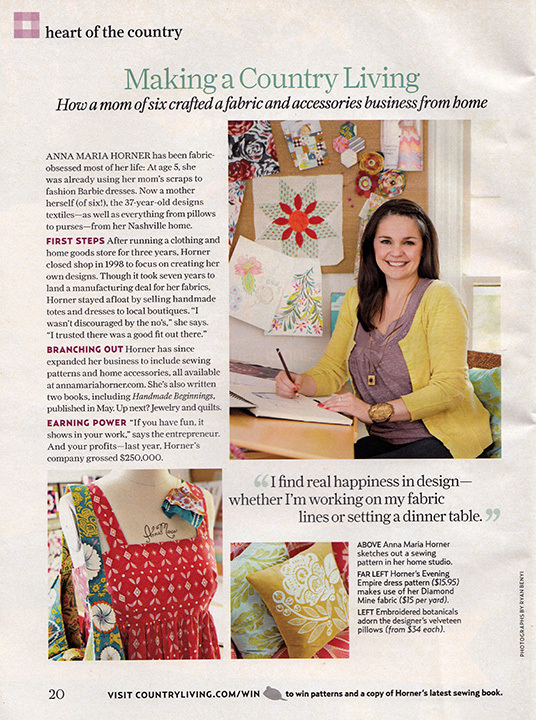 In one particular issue (the July/August 2010 issue to be exact), I came across this article, about Anna Maria Horner and her career as a fabric designer. I was intrigued by the article, but what caught my attention the most was the floral sketch on the bulletin board in the photo. I recognized that design! It was from my dorm room bedding! That sketch turned into Anna Maria’s Small Gathering print in her Good Folks fabric line. I had picked it out and designed my dorm room around it the summer before. My mom is a seamstress and I grew up sewing and crafting and have always had a love of fabric. But never before had I put much thought into who designed the fabrics I bought. The whole idea surrounding it was exciting. Maybe I could do that! Not just design boring logos and business graphics, but use my love of art and painting to create designs for fabric! I spent the rest of the summer just giddy about the possibilities. Tulane didn’t have the option to major in textile design, or even graphic design, so I studied art (I ended up with a degree in English and Studio Art, Painting concentration) and made it my mission to teach myself as much about digital design as I could. I honed in on my Adobe InDesign, Illustrator, and Photoshop skills, and Drew and I even started a Web and Graphic Design business to make money during college. My sophomore year of college, I discovered the world of blogging and started following the blogs of Anna Maria Horner, Heather Bailey, and Sandi Henderson, some of my favorite designers at the time. I learned bit by bit about their design world through their blogs while I continued to study English and Art and learn digital design on my own. But I was still left with a desire to learn how to create patterns and repeats and how to get into such an elusive industry as the fabric manufacturing world. After college, I started working full time as a graphic designer while continuing to learn surface pattern design by taking online courses, reading books, and playing around in Illustrator. I started making connections in the industry, which led me to Quilt Market, where I met Anna Maria Horner (and many other amazing designers) in person. Several weeks ago, I was able to travel to New York City to take an in-person Fabric Design Workshop with Anna Maria Horner and Heather Ross. It was an amazing experience to learn from Anna Maria after admiring her work for so long! What was even more amazing, is that she actually brought that Small Gathering sketch from the Country Living article bulletin board to the workshop and talked about the process behind it! She drew it while watching her children’s swim meet with art supplies that she had packed for her kids to color with. There is much more to my creative story, and it is nowhere near over, but it amazes me how Anna Maria Horner and this sketch/print in particular tie into it. Isn’t it amazing when things come full circle?